Do you want to redo your floors but think you don’t have it in your budget? At our showroom, we’ll show you how affordable new flooring can be. We have a huge selection of both discount vinyl plank and laminate flooring for anywhere from 20% to 70% off regular retail prices. But our inventory isn’t the only thing that’s expansive—our product knowledge is too. When you work with our sales associates, you can get all the resources and information you need to make the perfect choice for your home. For more than 15 years, we have maintained a reputation for excellence in our products and services. Our clients include trade professionals like remodelers flooring installers, designers, and property managers. However, we also serve the needs of individual homeowners. So when you need discount laminate flooring, or any other type of flooring, turn to us for products and services you can count on. Are you unsure of the benefits of different flooring materials? With new manufacturing processes and our commitment to offering a superior product selection, both vinyl and laminate floors are great options for anyone who is considering a hard-surfaced floor. Both are made to a much higher standard that they were just a decade ago. But there are some key differences between them that can make a difference in your project’s results. Vinyl plank flooring is made from polyvinyl chloride, which has a lot more give to it than other hard-surfaced floors, making it extremely resilient. For a hard surface, it’s very comfortable to stand on, making it ideal for rooms in which you may stand on your feel a lot, like the kitchen. It also has a wear layer that makes it able to stand up to high-moisture areas. Laminate flooring, on the other hand, is made from a main layer of high-density fiberboard and smaller layers that are molded together. This makes it a harder surface than vinyl. However, because of this hard texture, it is better able to mimic wood, stone, and tile. Get the floors you’ve always wanted at a price that works for you. Because we are part of a larger national company, we have an incredible amount of buying power. This means we can not only offer our customers a lot of variety, but also keep our prices low. And by avoiding typical unnecessary showroom embellishments, we avoid retail markups you see elsewhere. At our store, we carry laminate floors from the top name brands, so you never have to worry about lowering your quality expectations just because you want a good deal. Laminate comes in a diverse range of colors and textures, so you’ll not only get the look of stone, hardwood, or tile, but also the feel. Are you worried about the cost of your next home renovation project? Whether you’re updating a single room or the entire house, you can trust us to give you the options you need at prices you can afford. Vinyl plank flooring is already a very cost-effective choice, but with our business model and buying power, you can save even more. And just because you aren’t paying as much doesn’t mean you’re getting an inferior product. In fact, with brands like DynaFlex, DynaGuard, and Landmark, you know whatever product you choose will last for years to come. To ensure you are getting the best value, we also link you to professional installation services. While many people think mainly about the upfront costs of buying new flooring, repair and maintenance costs add up over the years. The best way to ensure those continuous costs are minimized, consider turning to a professional installation team. We have a wide network of trusted industry professionals we know can get the job done right. Do you absolutely love your hardwood floors and want to extend them into the bathroom? Before you go down that road, consider our vinyl planks. 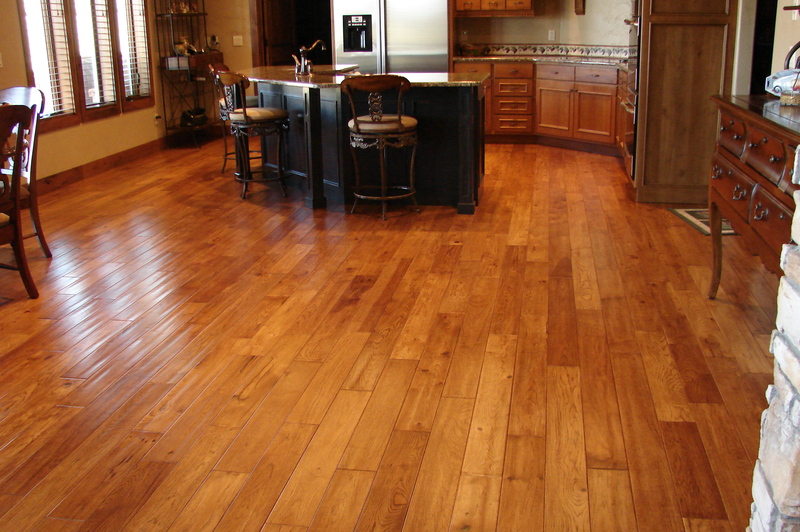 Natural hardwood is not waterproof and in high-humidity areas, it tends to warp over time. Since vinyl is so resilient, it allows for variation in temperature without cracking or warping. It is also 100% waterproof, which means it works perfectly in kitchens, bathrooms, and laundry rooms. If you’re concerned that it may not look as good as wood, we encourage you to browse through our selection. Modern manufacturing has given new life to vinyl, making it more beautiful and durable than ever. Whether you choose vinyl or laminate flooring, we want to make sure your new floors look great and last as long as possible. We work with a range of industry professionals in the community and know the best installers for any job. For no extra fee, we are happy to connect you to a licensed and insured contractor who have years of experience. With our high-quality products and connections to knowledgeable and skilled installers, you can finally get the floors of your dreams. Contact us today and start your renovation process with a free estimate on the cost of new laminate flooring. We proudly serve customers in Lake Charles, Louisiana, and surrounding communities.